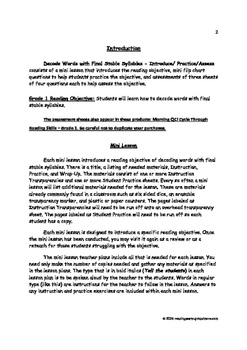 Decode Words with Final Stable Syllables - Introduce/ Practice/Assess consists of a mini lesson that introduces the reading objective, mini flip chart questions to help students practice the objective, and assessments of three sheets of four questions each to help assess the objective. 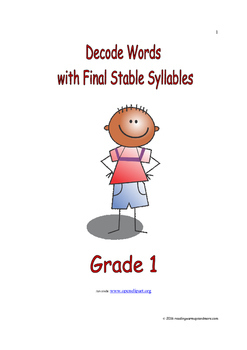 Grade 1 Reading Objective: Students will learn how to decode words with final stable syllables. Each mini lesson introduces a reading objective of decoding words with final stable syllables. There is a title, a listing of needed materials, Instruction, Practice, and Wrap-Up. 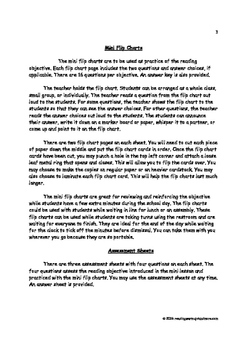 The materials consist of one or more Instruction Transparencies and one or more Student Practice sheets. Every so often a mini lesson will list additional materials needed for the lesson. These are materials already commonly found in a classroom such as six sided dice, an erasable transparency marker, and plastic or paper counters. The pages labeled as Instruction Transparencies will need to be run off onto an overhead transparency sheet. The pages labeled as Student Practice will need to be run off so each student has a copy.